Spatial ability has been shown to be significantly correlated with interest and success in STEM fields. It also has been linked to an embodiment in different ways. Tangible and embodied interfaces have been shown to support embodiment, including linking embodiment to changes in spatial ability. However, little research has linked the interaction design elements of tangible and embodied interfaces to specific effects on spatial cognition. Our research aims to gain a deeper understanding of the effects of tangible and embodied interfaces on spatial cognition and to develop interface protocols that enhance spatial ability training. Our current prototype employs tangible interaction with physical/digital blocks in a virtual reality environment to support perspective-taking spatial abilities. 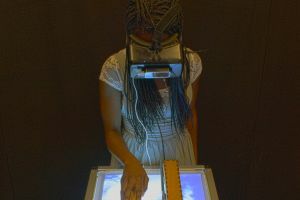 TSynlab explores emerging modalities in new media. Our research focuses on tangible interaction and sensing technologies that support creative expression bridging the physical and digital worlds. Applications range across media arts, entertainment and educational domains.